The second time I made two smaller cranberry wreaths. I stood back to admire my handiwork, as the wreath hanging on the left side of the twin doors I was decorating, came crashing down. The foam broke into a million pieces, scattering cranberries all over the porch. 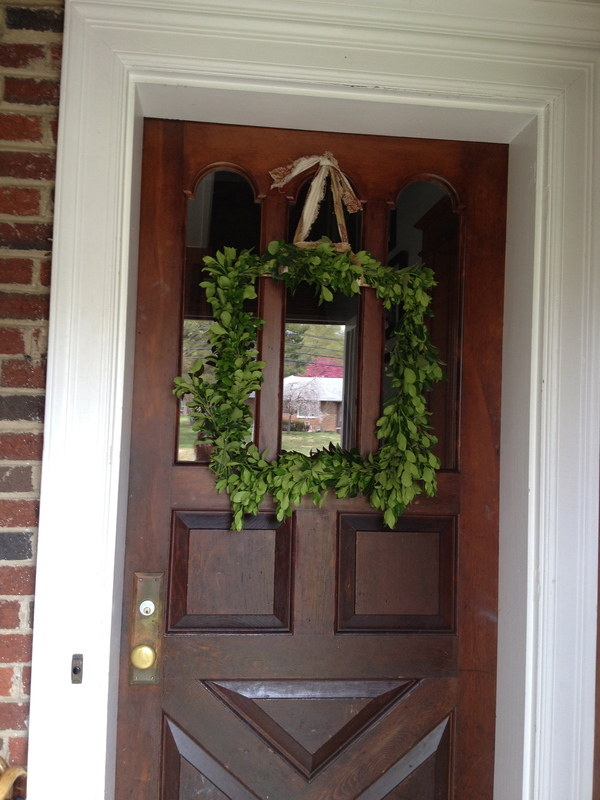 I cried and vowed to end my wreath-making career then and there. 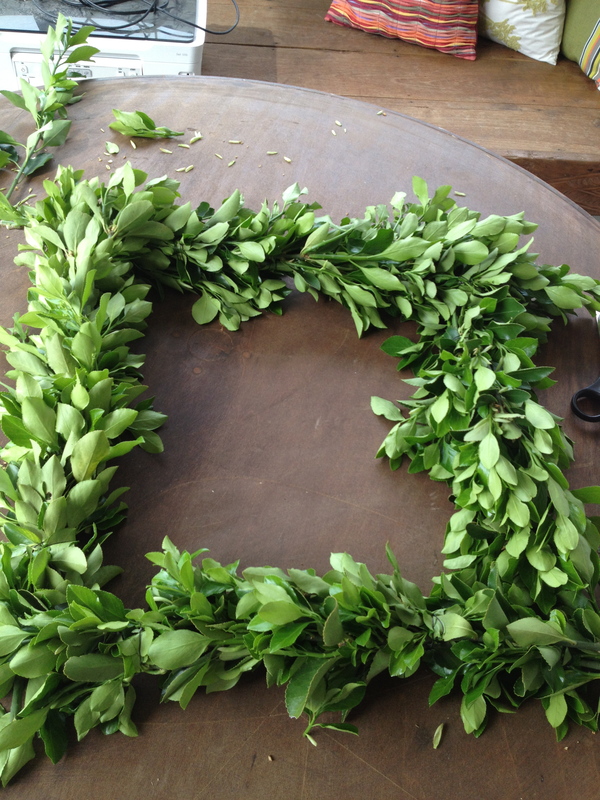 A Square, Spring Garden Wreath. So, wreaths and I are not on such great terms. But, I do love them so! This wreath is easy. And Spring-like! It only took about an hour to make. I used fresh greenery, so it will not last forever. I love the square shape. 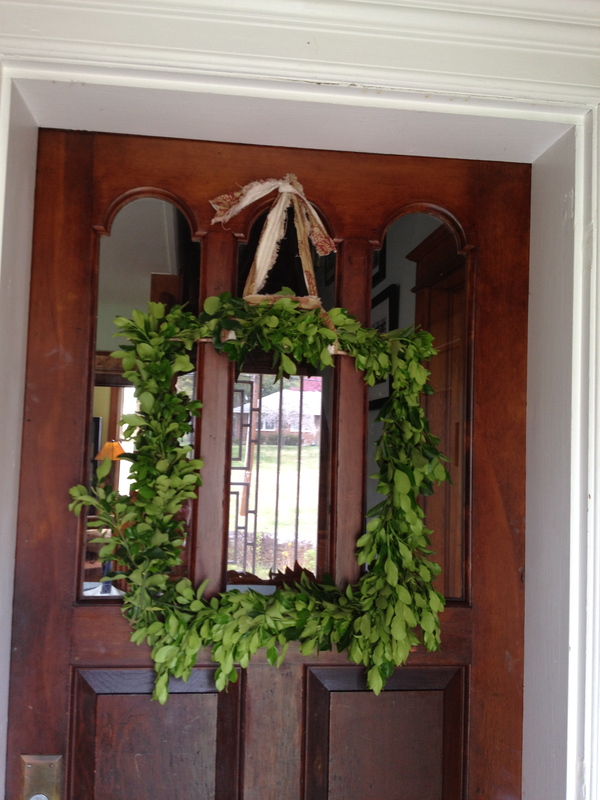 Who says wreaths have to be round or oval? A big bunch of greenery. You can use floral wire. 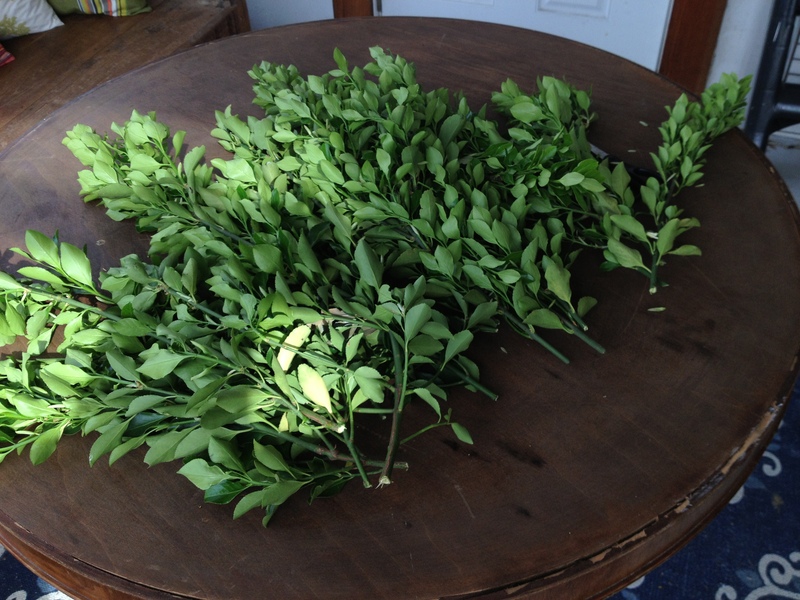 I cut greenery, from a completely overgrown bush in my backyard that had a small leaf that resembled boxwood. 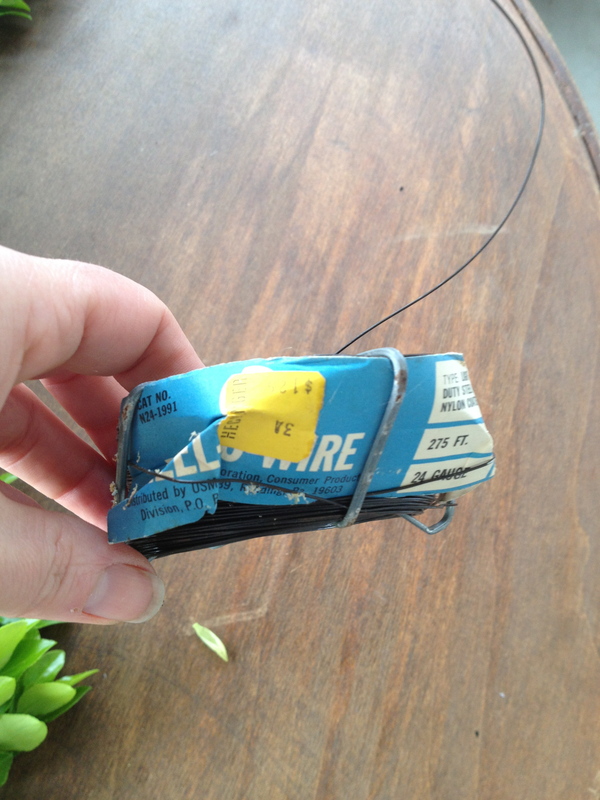 Then, I wired together the stems, maintaining the square shape as I went along. I used enough stems to create a sturdy structure that would hold the square shape and used a stick across the top to keep it straight. I cut a strip of leftover fabric that has a burlap-esque look to it, to hang it with. I did not have any burlap, which would have been ideal for the ribbon. 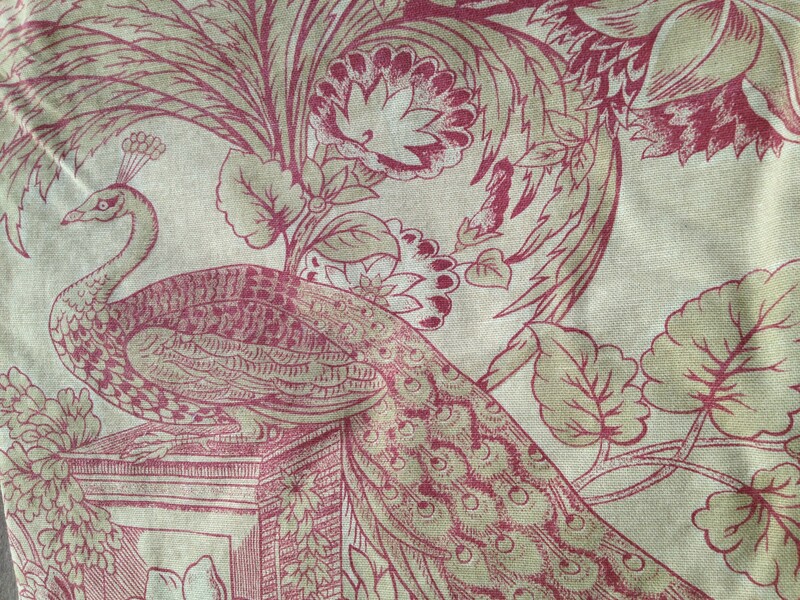 I love this piece of leftover fabric. After a four-year hiatus from wreaths, I have decided to conquer this simple and elegant square-shaped wreath, and will enjoy it on my front door until it wilts, which will probably be tomorrow. © copyright 2013 Mariam d’Eustachio. Spring flowers in a pitcher. I don’t know what causes creativity, but sometimes it is a curse. The monsters under the bed can be so real! A creative person might be willing to believe any story they hear because for them, it is not necessarily out of the realm of possibility. As a child, I may have held the world record for being the most gullible and I had a hard time sleeping at night. My dad had me convinced for more than a year that the stains on the carpet came from our pet monkeys. I do not need to go into the details of this, but needless to say, I think I can blame at least part of my creative streak on him. It is ironic that I don’t like to garden. I am fond of gardens in general, and when I was little and had a bad dream, I would run to my mom’s bed and we would talk about “my garden”. She neglected to mention how much work it is to have a garden and it was just somehow always beautiful and serene. She would describe the climbing roses and the flowery scents wafting by and how much fun I would have with my monkey (this one stuffed!) together in our garden. 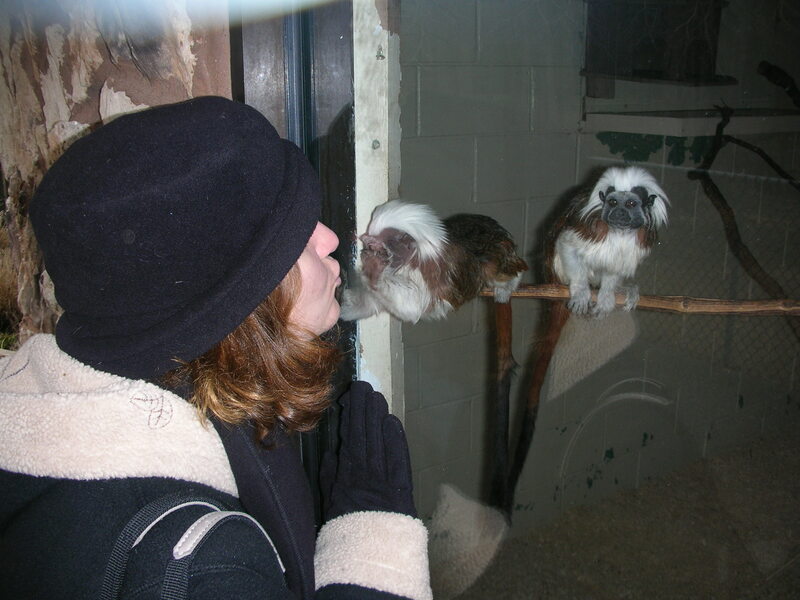 Tamarins, Cape May Zoo, New Jersey. One night I was terrified of some shadow in the room, and I was at my dad’s house instead of my mom’s. I ran to his bedroom and curled up between him and my stepmom and wondered how I was going to calm down because this was NOT the routine. My stepmom just rolled over and went back to sleep and my dad said, “What does your mom do when you can’t sleep?” So I told him about the garden. I went into great detail because he had never been in it before. Finally, he says….“Where are the cows?” and I said “What cows?” “Cows are smelly and leave piles of manure, why would I want those?” He said, “Don’t you need manure in a garden?” Funny thing is I was so distracted by all of his silly ideas that I eventually drifted back to sleep. From then on, I ended up with the occasional cow popping through my garden. My house here in Beltsville has a wild sort of garden. I think the official title for that type is “cottage”. 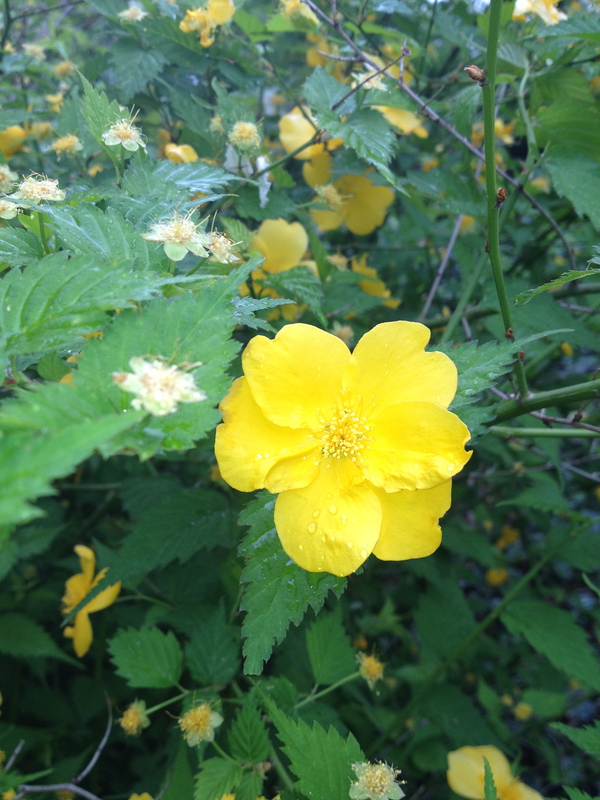 We have all sorts of interesting plants because the original owner was a botanist at the nearby Beltsville Agricultural Research Center. He is responsible for poinsettias lasting through Christmas and other magnificent plant-type contributions. Here are a few highlights from my garden, the one I am in no way responsible for. I hope to one day tame it a little. 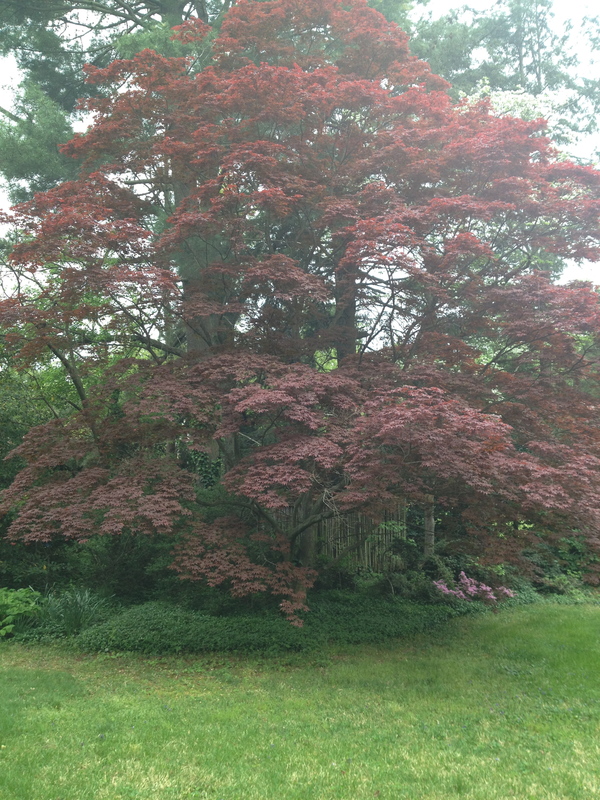 Momma Red Maple. She produces many little seedlings. Spring flowers in the garden. 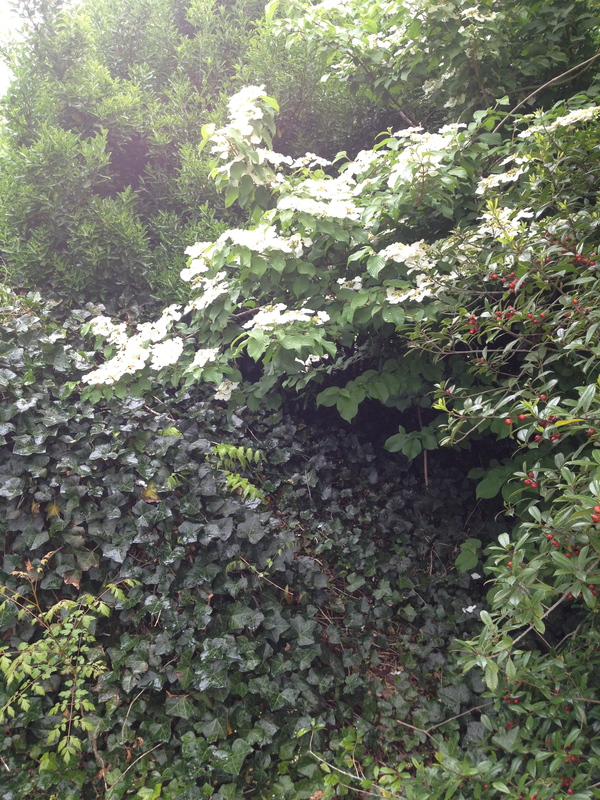 The ivy is hiding a root cellar. Spring is a beautiful time to be outside. 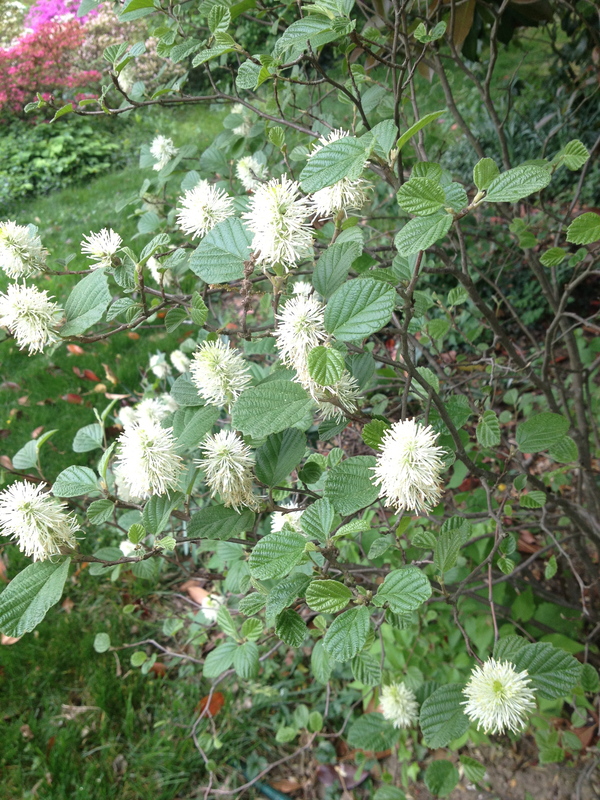 Take your allergy meds and appreciate the beauty unfolding before you. 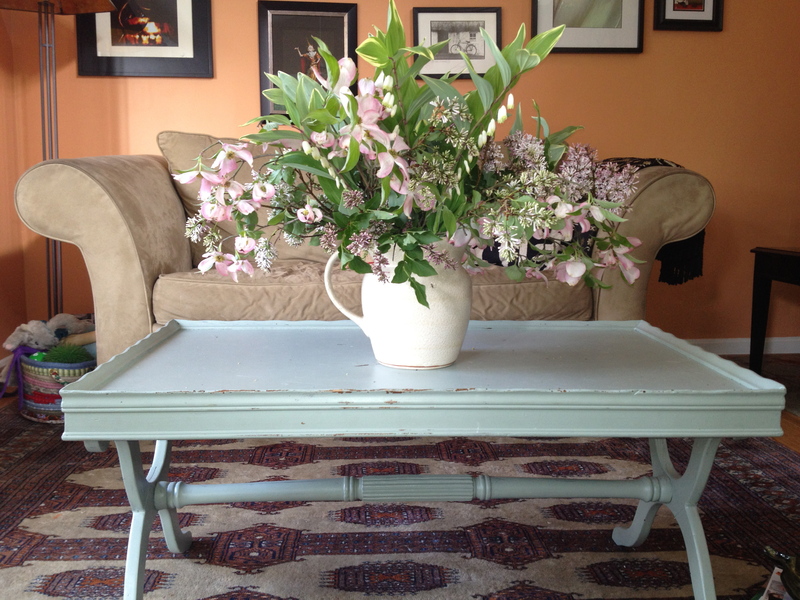 Cut some dogwood, lilac, camellia or quince and bring a little piece of spring inside. © copyright 2012 Mariam d’Eustachio. These are a few of my favorite blogs!